This one was written and penciled by me, inked and lettered by D.F. This comic is a day late because I, uh, forgot. I mean, I drew all of these comics years ago--you'd think I could keep to a consistent release schedule. Anyway! Fuzzball and Scuzzball first appeared in the second issue of Messy Comics, written and drawn by D.F. French, back in 1986. Chappy first appeared in the third issue of Messy Comics. But who was in the first issue? None other than that slovenly super-hero, that disorganized do-gooder, Messy Man. 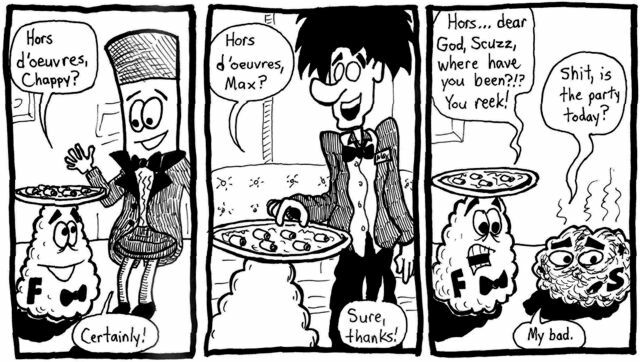 Years later, when we revamped Fuzzball and Scuzzball's supporting cast, we decided that Messy Man had retired from crimefighting and become regular guy Max Mancini. And after the whole "regular guy" angle got kind of boring, we decided to make Max into a mad scientist. Here he's just hanging out at the party, but about 20 episodes from now you'll see him do some real mad science.